Another fashion season has passed and designers from the four major fashion meccas premiered their Spring/Summer 2011 collections. 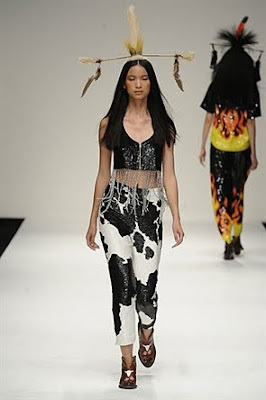 Last February, I posted a 2010 New York Mercedes-Benz Fashion Week Debrief, in which I presented findings from my 'pictorial/textual' analysis of the week’s events, specifically focusing on any stereotypically Native American or primitivist influences in the various Fall 2010 collections. Because “the Indian” proved to be a popular source of inspiration again this season, I decided to take a similar round-up approach, but I have also expanded to included designers from London, Milan, and Paris. I discovered that many collections were accessorized with fringes and feathers, and tribal prints and references to ‘the other’ were also in abundance. ‘Cowboy and Indian’ themes and Wild West references were the most popular, but other themes, such as ‘Military Gone Native,’ ‘1970s Hippie Indian,’ and ‘Modern Amazons,’ were also favored this season. Many fashion theorists have stated that it is the nature of fashion to recycle and borrow ideas from different cultures and different time periods. Therefore, this review does not focus on the fact that ‘borrowing’ occurs, but rather that this borrowing has ramifications. My inquiry has more to do with the effects of cultural borrowing in fashion – in particular 1) how this borrowing is perceived by the public, 2) how fashion critics and consumers understand Native cultures, and 3) how the appropriation of “the Indian” in fashion relates to the mis-representation of Native people in popular culture and perpetuates negative stereotypes. To investigate both ‘the Native’ in fashion as well as how it is perceived, I not only conducted a visual analysis, but also a textual analysis of each of the four major fashion weeks. After finding a collection with Native or tribal influences, I searched for runway reviews to examine the ways in which critics wrote about the collections. This tactic unearthed some interesting commentary: in New York, Ralph Lauren’s presentation was referred to as “battles between cowboys and American Indians;” in London, Ashish’s Rodeo Drive collection inspired many to ‘dress up’ like Indians in kitschy headdresses; in Milan, Cavalli’s models were described as “a tribe of snakeskin-wearing, fringed and tasseled primitives,” and one reporter declared that Gucci’s dresses looked like “they could be part of an American Indian tribal ritual.” Interestingly, there were little signs of the Tribal Trend in Paris. I counted about thirteen different shows that demonstrated significant Native American-inspired collections at the Mercedes Benz Fashion Week in Manhattan. Instead of critiquing each, I will instead focus on one – Ralph Lauren. Lauren frequently uses Native themes in his collections to reference the ideas of the West and of ‘the frontier.’ The aesthetics of Navajo blankets were incorporated into this latest collection via vests and hobo bags, and the use of Native elements such fringe and concho belts evidently confused some viewers into thinking this collection portrayed “battles between cowboys and American Indians” which is altogether inappropriate to say such a thing, and supports my theory that fashion collections that are inspired by a generic sense of Indianness reinforces negative stereotypes. About his collection, Lauren explained, “these are worlds, and they are dreams for people.” His re-imagined version of the West in the nineteenth century was depicted in an undeniably ‘whitewashed’ palette. Not only was there a preponderance of white garments, but there was also a preponderance of white models. Lauren exercises a form of power maneuvering in which he presents expensive garments to an affluent audience, and does so in a way that whitewashes our history and romanticizes our past. Once again, our story is told from the mouths of the elite. While some may contend that Lauren has done much for Native people (in that he brought the Western look to a broader audience and made things like Navajo blankets chic) I, of course, disagree with this argument. The beauty and artistry of Native aesthetic culture stands on its own. Over at London Fashion Week, there were fewer Native-inspired collections than in New York, however two very different yet notable shows deserve discussion. The first was Vivienne Westwood’s Red Label and the second was Ashish’s Spring Collection. Westwood based her Red Label spring collection on the story of Leonard Peltier, a long-jailed American Indian activist. The Westwood collection fused military-inspired garments with Native-inspired prints and faint blue facepaint. Westwood sought to put her notoriety to use and support certain causes: she proclaimed (in her collection booklet) that Peltier is innocent (and, for this show, she also promoted the legal organization Reprieve, which works on behalf of prisoners at Guantánamo on death row). I personally enjoy Westwood’s rebellious nature and appreciate the fact that she supports the people who inspire her. More designers should follow her lead. Reviewers of her show applauded her military-meets-Native style (some calling it Navajo-inspired, which is interesting considering that Peltier is actually Chippewa). Some of her models even wore headbands emblazoned with the word ‘BRANDED.’ Throughout her collection, she made statements about negatively labeling groups of people, stigmatizing people, and the ‘branding’ of Indigenous cultures in fashion. Ashish is an Indian (from India) designer working in London. His collection, named Rodeo Drive, brought a hyperbolic hybrid of cowgirls, Wild West Indians, and kitschy Americana – all dipped in a sea of sequins. The only thing missing was the spaghetti Western movie set and horse. The reviews of Ashish’s show were mostly positive, and many dismissed the tastelessness of his collection as part of his exciting creativity. One reviewer saw the collection as an 'homage to Indians', and others were inspired to ‘dress up’ like Indians – which, if you’ve been following the discussions on the Tribal Trend, treads awfully close to crossing the line into other dangerous forms of racial ‘blackface’ (read here to see why). In sum, his gross stereotyping, caricaturizing, and mockery of American Indian cultures were applauded by his reviewers. At Gucci, creative director Frida Giannini presented a collection for “modern amazons; an intellectual tribe of exotic women.” This collection featured tribal-inspired beadwork, vivid colors, feathers and Aztec influences. One reporter remarked that “dresses thick with jade or orange feathers looked like they could be part of an American Indian tribal ritual.” This tactic – of ascribing something secular with Native spirituality – is not a new one, and has been employed by salespeople for over 100 years. For example, old tourism shops frequently lied about the sacredness of various Native-made objects in order to fetch higher prices. Both Cavalli and Gucci continue this legacy of capitalizing off of exoticizing 'the Other' (click here to see why this is not ok). Jezebel even picked up on it. In Paris, couturiers do not seem interested in the tribal trend as it is interpreted by designers from New York, London, and Milan. There were equestrian references, but no cowboys; there were fringed dresses, but no kitschy references to Indians. Whereas in London, Westwood’s Red Label was inspired by American Indian activist Leonard Peltier, her collection in Paris showed no such influences. Susan Scafidi once stated, “Fashion makes no secret of ransacking the world’s closets in search of inspiration. The world, however, isn’t always thrilled to see someone else in its favorite dresses.” So while the world is ransacking ‘the Indian closet,’ does the current tribal trend reflect a true celebration of Native American cultures, or is it more reflective of a fetishism of these cultures? In an industry where Native people are significantly underrepresented, the aforementioned collections do little to accurately represent the creativity of Indigenous cultures. In fact, these collections perpetuate negative stereotypes, capitalize off of exoticizing ‘others’, mock Indigenous cultures, and continue the misrepresentation of Native people and their histories in mass media. This topic is relevant because scholars have argued that stereotypes have real world ramifications – namely, the enacting of laws and policies that govern Indian affairs based on the disparaging views of lawyers and policymakers. What can be done? Well, since the fashion world insists on elitist practices that make it rather impossible for Native designers to participate, I suggest collaborations between Native and non-Native designers, especially with individuals such as Ralph Lauren who have historically incorporated Native aesthetics into their clothing collections. Donna Karan’s collaboration with Cochiti Pueblo designer Virgil Ortiz is an example of a good collaboration. I’m looking forward to seeing what these designers produce for the Fall 2011 collections, to be unveiled in February, and I will be back with another full report. NOTE: Click here to read my past posts on Vivienne Westwood, Ashish, Ralph Lauren, or Virgil Ortiz. Great job! I don't think there is anyone out there more qualified to write this post than yourself. Keep up the good work and I can't wait to read the book when it's done! i love your blog. i find it strange that when non-native designers put out these collections, they almost always present the inspirations of either some plains indian or southwest nation. as muskoke.creek descent i would "like" ( don't know if that's even the right word to use but.. ) to see them tackle southeastern indians motifs. course the seminole patchwork and choctaw beaded collars are great starts. keep up the good work! will keep reading your posts to share with my students! Thanks for the comment darkcyde! - I've been wondering approximately how many Native students attend big fashion institutions like FIDM, and, more specifically, how their experiences have been. If you have any info on this I'd love to learn more! A provocative and eye-opening post.